My wife speculates that one of the main reasons why we bought our condo was my master plan to build a book nook into the second bedroom which we'd tagged as potential office space right away. Honestly, she might have a point. Aside from various other factors that affected our decision, the potential for awesome creative spaces in this place was definitely up there. There's just something about making a space truly yours that sparks creativity and productivity and I've been lucky enough to be able to make this mine. Obviously it's super nerdy, with plushies, book flowers, and an army of action figures and Funko Pops on my desk, but it's also where I get work done. Maybe that's an anachronism and some might advocate to compartmentalize more, keep your spaces to relax separate from the spaces that mean work. I'm more a fan of a positive interdependence here. 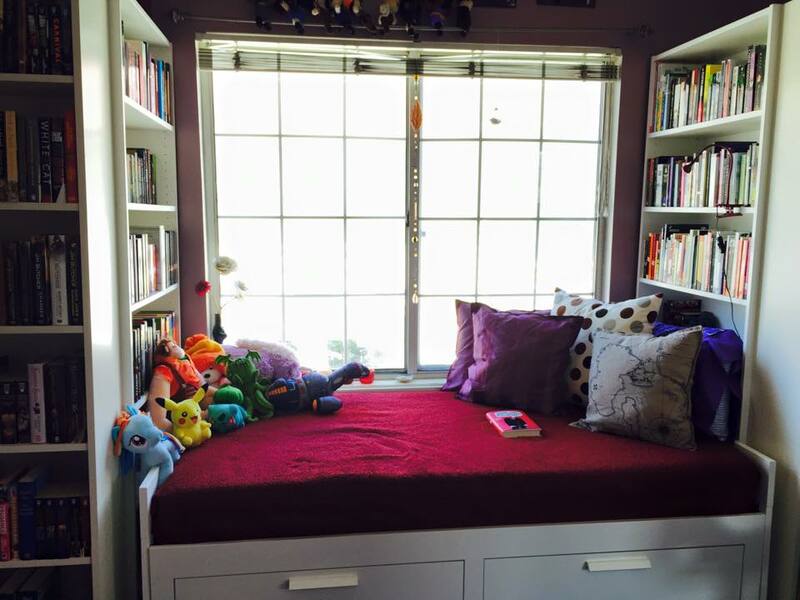 Anyway, people keep asking me what I used to make my book nook and writing corner, so here's a more or less comprehensive list (freely add lots of nerdy bits to taste, of course). All of this is IKEA, btw. and if I sound like a commercial for modular Swedish living then maybe it's because I literally won't go anywhere else for furniture, but that's just me. Also, it's basically like legos for adults, so that's a plus. To ensure stability of the shelves, we screwed them together at the corners. Without that, the whole affair gets scarily wobbly, so I would highly recommend this. Also, if you're like me and your library is constantly growing, you can buy extension shelves for the bookcases, which is cool, especially if you have high ceilings. Also, I do the bulk of my writing and work at my desk, but didn't want anything huge and bulky to take up space, so I went with a Norberg wall-mounted desk to create my writing corner. This works well if you are working on a laptop, since it can be folded down to hang from the wall and be out of the way, but I'm not sure I would go this route if I used a heavy desktop. The desk itself is really sturdy and being able to fold it down means I have a much easier time getting at the whiteboards that hang above my desk. Just an added plus, especially when you're working without a lot of clutter (army of action figures and Funko pops don't count). Of course all of this is based on the layout of the room and I was lucky that the measurements panned out perfectly. But this is where form meets function for me. Everyone has their own specific space or spaces where they get their best work done and this is mine. I'd love to see any pictures and/or ideas of your awesome writing spaces in the comments, so feel free to share!